Last weekend marked a momentous occasion for men’s tennis in this country. In 83 years, no British Davis cup team had ever come back from two rubbers down to win a tie. This includes great names like Fred Perry, John Lloyd, Tim Henman and so on. Instead it featured James Ward and Dan Evans, two players that are not even ranked within the top 200 tennis players on the ATP tour. Yesterday, they were drawn against Croatia for a place in the world group in September. 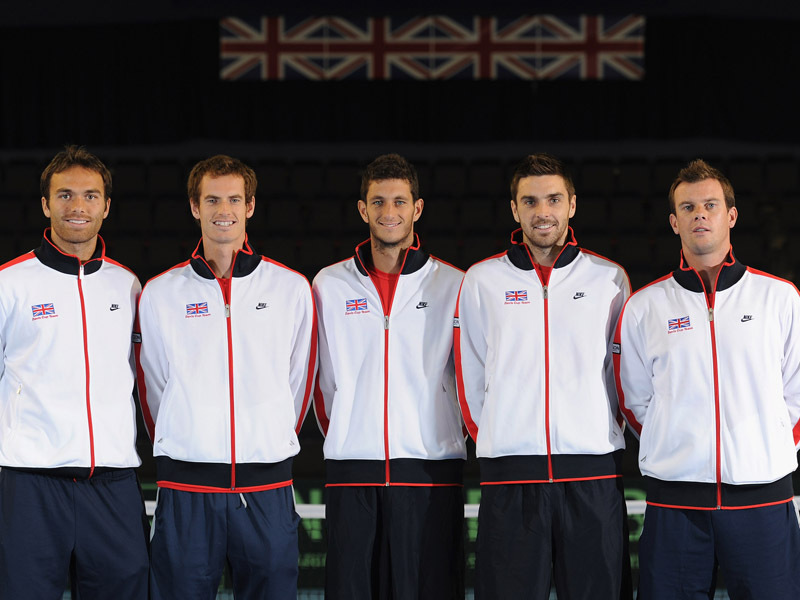 Left to right: Ross Hutchins, Andy Murray, James Ward, Colin Fleming, Leon Smith. At first glance this sounds a daunting tie, which it is. It will be a hostile environment for the players to deal with and they will need to adapt quickly. There is a glimmer of hope however. It is likely that Andy Murray will return to the team for a trip to Zagreb, as it is the glamour match he has been hoping to be involved with. The last significant match he played was a trip to Buenos Aires in 2008. The Argentines won 4-1 and pushed Great Britian back out of the World Group immediately after gaining promotion. Good omens do surround the meeting of these two nations. It was in fact a victory over Croatia which sealed there return to the World Group that year. Murray played and won two of the rubbers, including a thrilling five set victory over Marian Cilic (Croatian Number 1) at Wimbledon, to stamp his authority on the world stage at the tender age of 20 years. Both players careers have parallels. They were making big impacts on the tour as teenagers, whilst carrying the hopes of a nation on their shoulders from such a young age. Cilic beat Murray on the way to the French Open junior title in 2005 but since then, the giant Croat has only been victorious once in nine meetings. They last played in the quarter finals of the Miami Masters at the end of March, where Murray marched through in straight sets on his way to the title and to number 2 in the World rankings. If all goes to plan this would be the crucial match in the tie. Croatia, who were winners as recently as 2005, have a fantastic reputation over such a short history of independence but the players who were crowned champions have since retired. No more Ivan Ljubicic or Mario Ancic, leaving the rest of the squad running a little thin. The two other likely selections are in the latter stages of the career but are ranked highly. Ivan Dodig is number two and ranked just outside of the top 50, whilst the ever dangerous big serving Ivo Karlovic can be a threat to anyone on his day. Standing over 2 metres tall it is no wonder he has held the records for fastest first and second serve at some point. On the contrary he is also one of the most immobile tennis players ever, so a player akin to Andy Murray will stifle his serve and drag him around the court like a rag doll. Looking closer to home, the likely team selected by captain Leon Smith will be similar to that which came back to beat Russia. Tim Henman has been quoted as calling the state of men’s tennis as ’embarrassing’. No players in the top 200 is a shambles for the governing body the LTA. For such a big organisation and the funding they give out to players, they are getting little back. The national tennis centre at Roehampton, that opened in 2007, has been seen as perfect setting for developing talented players. Its results have been severely questioned by many. The lack of talent has been questioned in the media but it is those who are coming through the junior circuit now, which are providing optimism for future success. Oliver Goulding and Liam Broady have both seen success on these fronts and as they develop onto the World circuit, the first real results of the academy, will be analysed stupendously. No one has come through to the World stage in the country via the LTA since Henman in the 90’s. Andy Murray famously took his own route through Barcelona to get himself to the top of the game, whilst at the same time bemoaning the inefficiency of the ruling organisation. The World number 2 has a point. It is an extemely expensive way of developing your own talent. Only wealthy families can push there children through, making it an exclusive hobby. The great lengths of travelling to get to tournaments and events, drives the younger generation away. Nobody wants to travel mile after mile to get to a decent training camp or their nearest tournament, especially as a youngster. Interest is lost easily and is harboured into other sports which are cheaper and nearer. Things need to be done to prevent future talent from wandering into other fields. I seem to negate the effectiveness of the LTA but this is merely through frustration. They have however, given great cause for belief in Croatia due to their emphasis on doubles play in all competitions. Any casual player at a club will spend the vast majority of time play with a partner rather than solo. Through my experience of playing, I know of one such national league which fuses both throughout its denominations into regional and county levels. The success of this can be seen in the ATP doubles rankings. Seven players within the top 100, with six of these reaching the top 50 at some stage of their career. There are two winners of majors; Jamie Murray and Johnathan Marray, with the latter reaching the semi-finals of the end of year championships too. There is great belief in the British camp that they can prevail in any doubles match due to the number of specialised players now in the ranks and I would support this. It similarly removes strain from the key man Andy Murray during a Davis Cup weekend. He now no longer has to be put through potentially three five set matches in consecutive days, which will benefit him physically in the long term. With the new confidence in the team, coupled with the success of the junior players, the future is rather less embarrassing than first feared. ← Can Christmas Predict The Future?